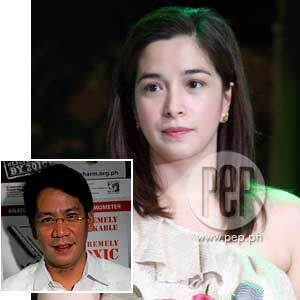 While everybody thought that politician-TV host Shalani Soledad has something going on with Wil Time Bigtime co-host Willie Revillame, the lovely councilor of Valenzuela City is now dating a congressman—Pasig representative Roman Romulo (inset). Guess who Shalani Soledad is dating? Roman is the representative of the lone district of Pasig City. He is also the son of former Department of Foreign Affairs chief Alberto Romulo, and brother of Guadalupe Romulo, Mons Romulo-Tantoco, Bernadette Romulo, and Erwin Romulo, the editor of soon-to-launch Esquire Philippines. Shalani and Roman were seen around midnight today, September 2, in Baclaran church. The couple were also spotted last week at The Peninsula Manila Hotel. Roman reportedly said to friends that the relationship is "Umuusbong pa lang." Shalani, who is a councilor of Valenzuela City, has always said that her love is "politics." Roman, being a lawmaker, obviously fits the bill. Shalani came into the public eye when she became the girlfriend of then-Senator Noynoy Aquino. But the two broke up shortly after PNoy won in the Presidential election last year. Shalani was also linked to her co-host in the TV5 variety-game show Wil Time Bigtime, Willie Revillame. But apparently, it was all talk. PEP.ph (Philippine Entertainment Portal) has already gotten in touch with both Shalani and Roman for their respective statements. As soon as we hear from them, PEP will immediately post their reactions.